Thanks to the tireless volunteer work of John Allen, Robert Seidler, and of course Keri Caffrey, we now can share the first video from the I Am Traffic Colloquium. 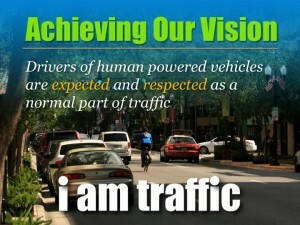 In this presentation, Keri lays out our take on the core bicycling-related problems we see in our traffic culture, the ill-advised “fixes” that many are promoting, and our own vision for real solutions based on a clear understanding of the problem. 26 minutes of information that will make you really think. Keri, thanks for your work to put this together. This is a terrific presentation and it’s a great message both for those who were fortunate enough to see it in person and us in the much Internet greater audience who are taking it in over the web. Fantastic presentation, Keri! Thank you (and all who helped get this posted) for presenting the “follies of the fixes” so well!